The Massachusetts Lemon Aid Law (Massachusetts Lemon Law) allows you to void or cancel a motor vehicle contract or sale if your vehicle fails to pass inspection within seven days from the date of sale AND if the estimated costs of repairs of emissions or safety related defects exceed 10% of the purchase price. ( M.G.L. c. 90 §7N) This law applies to both dealer and private party sales of cars and motorcycles purchased for personal or family use. Dealers must display your Lemon Aid rights by putting a sticker on the left front window of each used car at the time of delivery. By law, sellers of used vehicles must remove inspection stickers prior to transferring the vehicle to the new owner. Motor vehicle inspection stickers are not transferable to a new owner. When you buy a used car, you must bring the car to a licensed Massachusetts Inspection Station within seven days of registering it. In order to be protected by the Lemon Aid Law, however, you will need to have it inspected within seven days of purchase. For your own protection, do not allow the dealer to do the inspection for you. Cars that do not run automatically fail inspection. To be eligible for a refund under the Massachusetts Lemon Law, you must demonstrate that the estimated cost of repairs for safety or emissions related defects (and not the problem that is keeping the car from being inspected) is more than 10% of purchase price. Proving this may be difficult because it requires that a mechanic locate the problems and estimate the cost of repairs for these defects. Get a written statement, signed by an authorized agent of the inspection station, stating the reasons why the vehicle failed to pass the safety or combined safety and emissions inspection test. Obtain a written estimate of the costs of the necessary emissions or safety repairs showing that those costs exceed 10% of the purchase price. Notify the seller of your intention to void the contract under this statute ( M.G.L. c. 90, §7N). Do this by certified mail, return receipt requested, and by regular mail. Enclose a copy of the documents listed in Steps 1 and 2. Be sure to save copies for your files. Deliver the car to the seller, even if delivery requires towing services. It is advisable to take a witness with you and copies of the documents listed in Steps 1, 2, and 3. If the seller refuses to accept the car, prepare a statement indicating that you and a witness delivered the car to the seller on that date, but that the seller refused to accept the car. Be sure the statement is signed by both you and your witness in the presence of a notary public. If you comply with these provisions, you are entitled to a full refund of the purchase price. You and the seller may agree in writing to have the seller do the necessary emissions or safety-related repairs at the seller’s expense. You may, however, refuse the seller’s offer and accept a full refund. Contact the Registry of Motor Vehicles Title Division at (617) 351-9550. Explain that you are returning the vehicle to the seller under the Lemon Aid Law, and that you are requesting that a certificate of title be issued to you as soon as possible. When you receive the title, you should assign and transfer it back to the seller. If the seller refuses to accept the title, then send it by certified mail and retain a copy for your records. Sales Tax: Fill out an abatement form available from the Massachusetts Department of Revenue Taxpayer Service Division, P.O. Box 7010, Boston, MA 02204, (617) 887-6367. Registration Fee: If you return your license plates within 10 days from the date you registered your car, you will receive a refund less a charge of $5. If you return your plates after this 10-day period, but within a “reasonable time,” you will receive a partial rebate. Mediation is an inexpensive and informal way to resolve your dispute without hiring an attorney and going to court. Contact the Attorney General’s Office for mediation services. You may also pursue your claim through the court system. For claims under $7,000, small claims court may be the least costly alternative. Consumer Affairs publishes a Consumer’s Guide to Small Claims Court available upon request. Larger claims may be more suitable to District or Superior Court. You should seek legal advice for all claims. If you do not qualify for a refund under the Lemon Aid Law, other laws and regulations may protect you. Unless otherwise noted, these laws do not apply to private party sales. In addition to any express written warranties given by the dealer, you are also protected by an Implied Warranty of Merchantability. This implied warranty is automatic with every car sold by a dealer. The dealer warranties that the car is safe and in running condition for at least a reasonable period of time. Consider such factors as the price paid, the car’s age, make, model and mileage to help you determine what problems the dealer should be required to fix. You cannot waive the implied warranty of merchantability. This means that a dealer cannot sell cars “as is,” “with all faults,” or with a “50/50” warranty. The law prohibits both dealers and private party sellers from turning back or readjusting the odometer or mileage indicator on any automobile offered for sale. All vehicles must have a certificate of title issued by the Registry of Motor Vehicles and must be properly endorsed at the time of sale. The dealer must inform you, on request, of the name and address of the prior owner of a car. Dealers must provide a written warranty to buyers who purchase a used vehicle with fewer than 125,000 miles at a purchase price of $700 or more. The law requires dealers to repair use or safety defects for either 30, 60, or 90 days, depending on the mileage of the vehicle. It also allows consumers to obtain a refund if during the warranty period they attempted to have the vehicle repaired three times for the same defect, or if the car has been out of service for repairs for at least 11 business days, and the defects still exist. In addition to the Lemon Aid Law requirements, a private party who sells a consumer a used vehicle must tell the buyer about any known use or safety defects. If the buyer discovers a defect which impairs the safety or substantially impairs the use of the vehicle, and can prove the seller knew about it, then the buyer can return the vehicle within 30 days of purchase. Private parties are bound by this law, regardless of the age or selling price of the vehicle. Automobile consumers are protected by laws covering those who purchase vehicles in Massachusetts that are found to have significant defects. These free programs offer an additional level of protection for consumers who purchase cars that fail to function as required by law. If you have recently purchased a defective vehicle, follow this simple tool to determine if your vehicle is eligible for Massachusetts’ Lemon Law, Lemon Aid Law, or Used Vehicle Warranty Law. You must be able to demonstrate that the defects must substantially impair the use, market-value or safety of the vehicle. For example, to prove market value impairment, you must show you vehicle is worth at least 10% less than is would be without the defect. 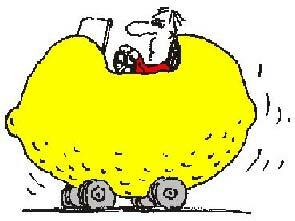 If the vehicle fails inspection, it may be eligible for Lemon Aid, however you must act quickly. Please contact our Office at 888-283-3757 for more information. Over seven days: The vehicle is not eligible for Massachusetts Lemon Aid Law, but it may be eligible for the Used Vehicle Warranty Law.